VANCOUVER — Looking for something to do tonight? Galleries and businesses throughout downtown Vancouver are gearing up for the first springtime First Friday, which kicks off at 5 p.m., Fri., April 7. This month’s Vancouver First Friday theme calls attention to April’s designation as National Poetry Month with a unique public art project known as “Rainku” that literally brings poetry to visitors’ feet with water-activated poems “written” on sidewalks throughout the city’s downtown area. 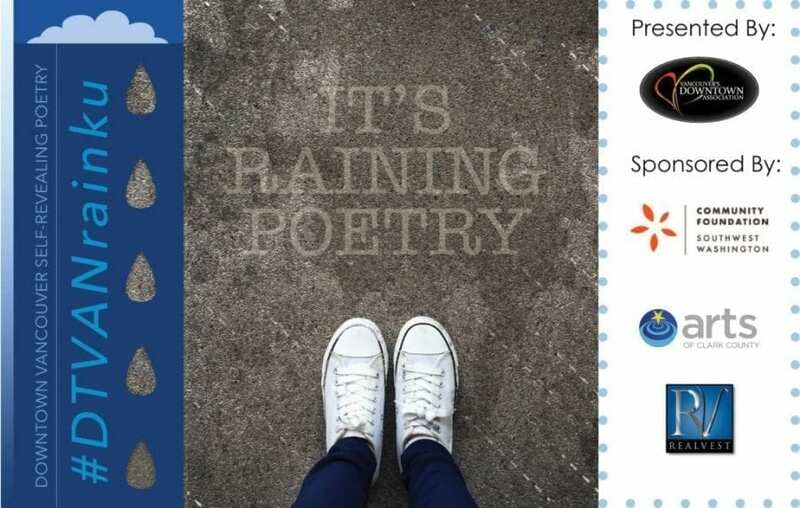 The poems appear when it rains, but Vancouver’s Downtown Association (VDA) assures First Friday visitors that they’ve got it covered, if tonight’s weather is dry instead of rainy. The VDA also has created a Rainku map showing all 24 of the poetry locations throughout downtown Vancouver. A two-person show by Elizabeth Ganji and Emily Schultz displaying artwork inspired by “nature, beauty and elegance” at Art on the Boulevard, 210 W. Evergreen Blvd. Featured landscape portraits inspired by the beauty of the Pacific Northwest by artist Ruth Schmit at Aurora Gallery, 1004 Main St.
A “Northwest Bounty” art exhibit featuring artwork that celebrates the springtime return of the Vancouver Farmers Market and “the riches of the Pacific Northwest” at Gallery 360, 605 Esther St.
An art exhibit titled “What Makes Us Happy” featuring artists Chrissie Forbes and Reid Trevarthen at North Bank Artists Gallery, 1005 Main St.
For more information on Vancouver First Friday, click here.